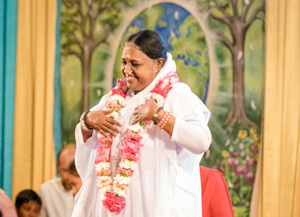 Upon the conclusion of Amma’s visit to Boston, Amma travelled down the East Coast to the nation’s capital for her annual two-days of programs in Washington, D.C. 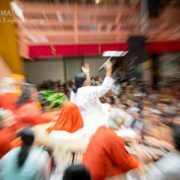 Immediately upon arrival, Amma graced the local devotees and tour staff with an unexpected stop at the beautiful MA Center DC in Potomac, MD. As everyone gathered on the expansive green lawn, Amma went on to serve a scrumptious dinner of pasta and veggie “meatballs” and then led everyone in singing a melodious Punjabi bhajan. Given that MA Center DC’s property had previously been home to Eunice Kennedy Shriver, a feminist advocate for the mentally disabled and founder of the world-renowned Special Olympics, Amma’s presence here as the ultimate example of Mrs Shriver’s vision of service was especially apt. 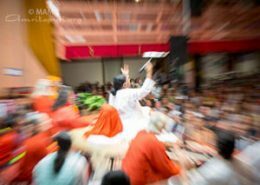 With the Ashram having recently undergone long-term renovation, it had been several years since Amma’s had visited the grounds. 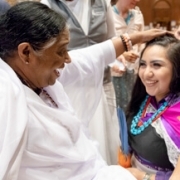 As sweltering heat fell upon the region the next morning, Amma began her programs at the Gateway Marriott hotel in Crystal City by leading a meditation for world peace and embracing everyone who had come to meet her. That evening she sang bhajans and spoke on a number of spiritual topics including the importance of preserving nature with love and respect and the power of optimistic faith and grace. 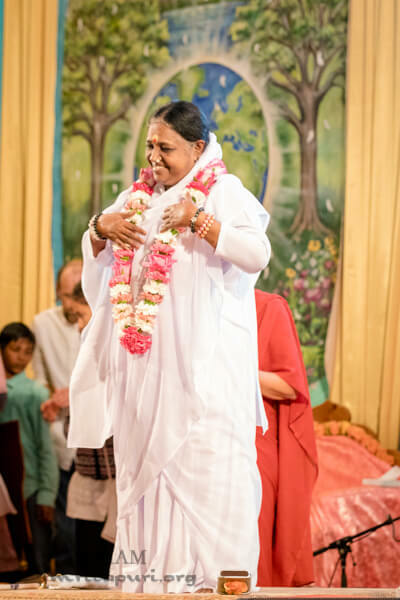 Afterwards, Amma’s darshan continued until the early hours of the next morning, while devotees from across the Southeast offered cultural dances. 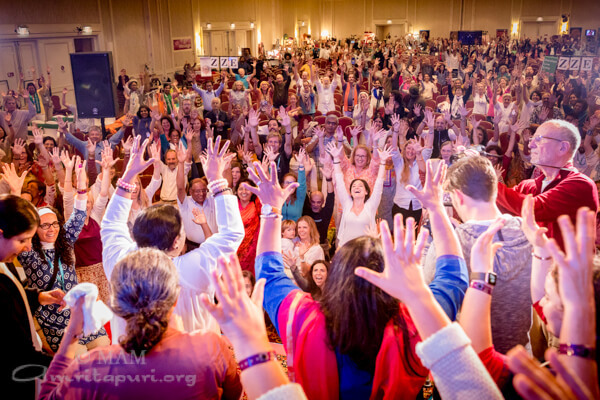 The final day of Amma’s DC visit was once again meet with large crowds. 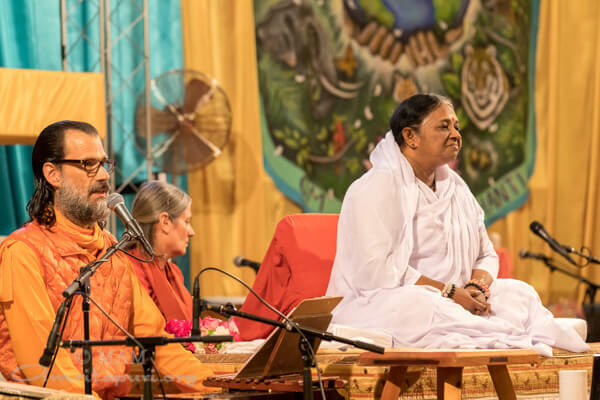 The morning meditation and darshan program were followed by Amma’s unique ceremony for world peace that evening and Devi Bhava darshan, which concluded only at 8:00 a.m. the following morning. 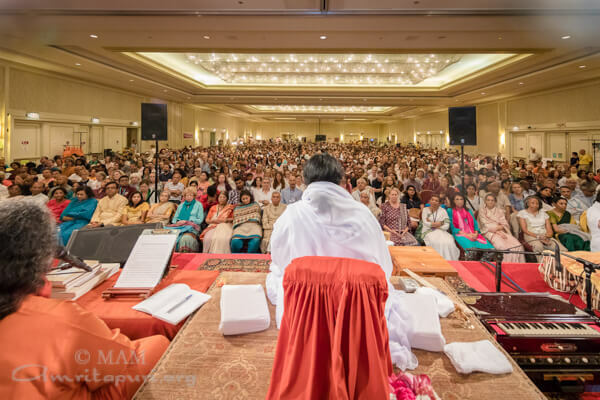 Each year, Amma’s visit to Washington D.C. is a cool breeze in the U.S. capital and in the hearts and minds of all those who come to meet her; a spiritual rejuvenation of peace dawns in the city and beyond.